The banner photograph above has been color-enhanced and doctored to make the overall effect more abstract (less cluttered) and highlight the major features of this unusual bird. 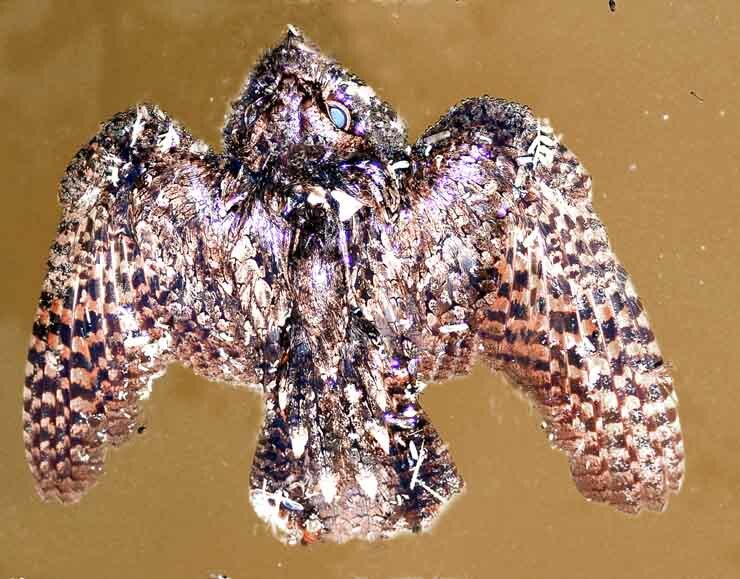 This poorwill was found drowned in a pool of water. As you can see, it has short wings, a short tail, but a very large head. Miklos Udvardy (citation misplaced, p. 606) says that Poor-wills in the California Desert have been known to endure "a long cold spell in torpid condition without food and with its body temperature lowered almost to that of the environment", so the one I flushed might have been near such a state (though it flew a considerable distance after being flushed). Poor-wills inhabit arid uplands from the Canadian border (where some of them go to breed) southward to California and Texas (where all of them winter). They lay their 2 pinkish-white eggs directly on the ground.